Many of us ate Nabisco Zwieback when we were little — you may remember the striped yellow box with a smiling boy on it. I was sorry to learn that Nabisco no longer makes this bread. It seems to have gone out of favor in the United States, although you can still buy zwieback imported from Germany. Rusk has been around since ancient times. It was praised by Hippocrates for its digestibility, and many centuries later, doctors would recommend rusk for children and invalids for that reason. But the main advantage of rusk was that the second baking lowered its water content so much that it did not spoil quickly. Legionnaires in ancient Rome were often provisioned with rusk, then known as biscoctus, Latin for “twice-cooked.” Note the similarity to modern English biscuit — biscuits were originally rebaked as well, but unlike rusk they usually had no raising agent. 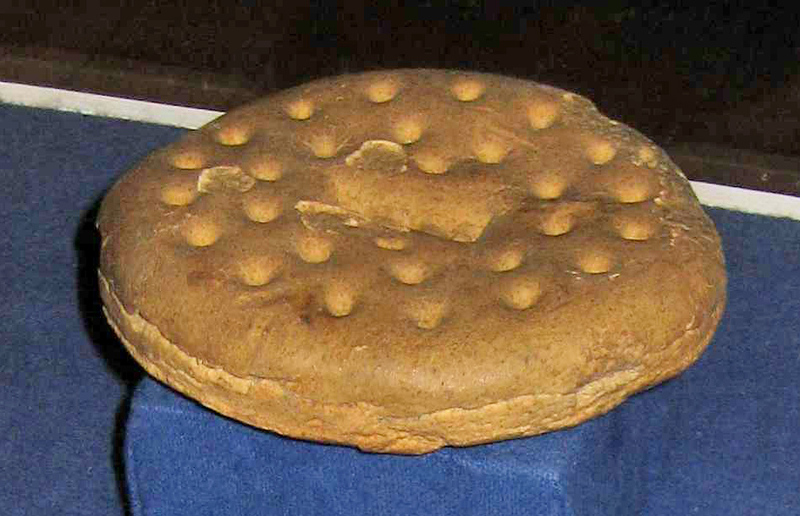 Oldest known ship’s biscuit (1852). Photo by Paul A. Cziko. The Oxford English Dictionary dates the word rusk to 1595. It was a common provision for sailors in Elizabethan times. The word may come from the Spanish or Portuguese rosca, referring to a twisted or coiled piece of bread. But early English rusks were just “smallish lumps of bread rebaked so as to be indestructible enough to last out a long voyage,” writes John Ayto, author of An A to Z of Food and Drink. A more refined, sliced rusk became common in the 18th century, according to Ayto. By this time various styles of rusk were made throughout the world. Some were savory, some sweet, and the flavorings varied. Also, some were rebaked in a hot oven, others just dried out in a slack oven. The Dutch made beschuit, the French biscotto, and the Greeks paximadi, to name just a few. Italian biscotto is a sort of fancied-up rusk, sweeter and more cakelike. Rub half a pound of sugar into three pounds of flour — sift it, pour on half a pint of good yeast, beat six eggs, add half a pint of milk — mix all together, knead it well: if not soft enough, add more milk — it should be softer than bread; make it at night — in the morning, if well risen, work in six ounces of butter, and bake it in small rolls; when cold, slice it, lay it on tin sheets, and dry it in the oven. Many Americans preferred soft rusks, baked just once. Nineteenth-century cookbook author Eliza Leslie favored these but noted that “you can convert them into Hard Rusks, or Tops and Bottoms, by splitting them in half, and putting them again into the oven to harden and crisp.” These were then usually eaten in the morning, dipped in coffee or tea. Zwieback rusks, introduced to North America by German immigrants, had similar ingredients but were baked in long rolls and then sliced vertically before rebaking. One type of zwieback was soft, with no second baking, which is odd given its literal meaning. It was made by Mennonite immigrants, who baked a small roll on top of a larger one, sort of like a snowman. This bread is still made in parts of Pennsylvania and the Midwest. Hard zwieback was popular in New York City, the birthplace of Nabisco Zwieback. 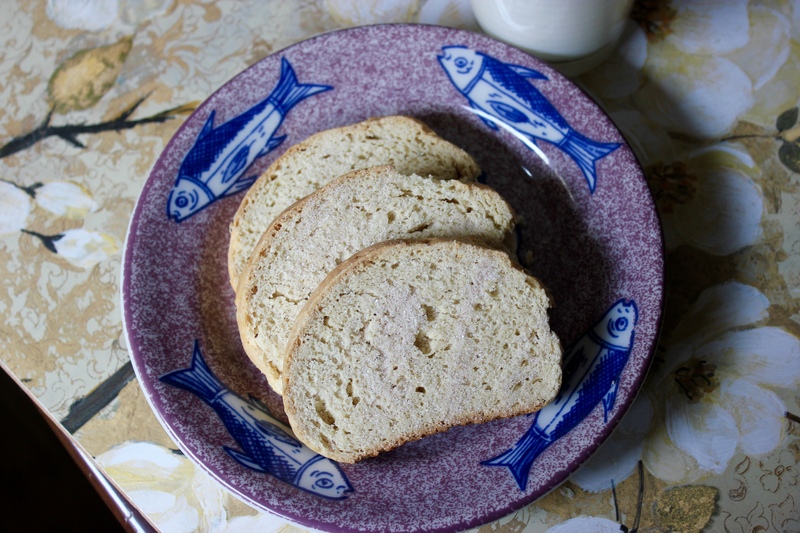 Baker Ludwig Anger began making this bread in the late 1840s. His bakery was sold to another that was eventually bought by the National Biscuit Company, the future Nabisco. Nabisco’s zwieback has been wonderfully re-created by King Arthur Flour, and an adaptation of that recipe is below. This zwieback is crunchy and slightly sweet, with a hint of cinnamon and nutmeg. You can make it sweeter by dusting it with cinnamon sugar before the second baking, in the style of a Finnish rusk called korppu. Finnish immigrants brought this style of rusk to Michigan’s Upper Peninsula about a century ago, and it’s still popular there today, now called Trenary Toast. Adapted slightly from a recipe by King Arthur Flour; see also that company’s blog Flourish for more about zwieback preparation. 1. In a large bowl, mix together all the dough ingredients, kneading for several minutes to form a smooth, slightly sticky dough. Cover dough and allow to rise about two hours, until puffy. 2. 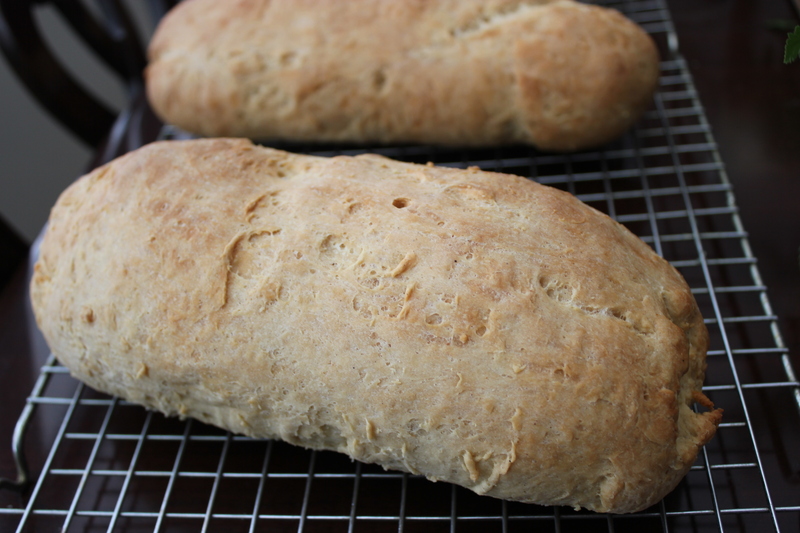 Divide dough in two and shape each half into a log about 12 inches long. Place the logs on a parchment-lined (or lightly greased) baking sheet and allow to rise for 90 minutes. 3. Toward the end of the rising time, preheat oven to 350°F. Bake the bread for 20-25 minutes, until golden brown. It should reach 190°F measured at its center. Remove from oven and allow to cool on a rack, then let rest uncovered overnight. 4. The next day, preheat the oven to 200°F. 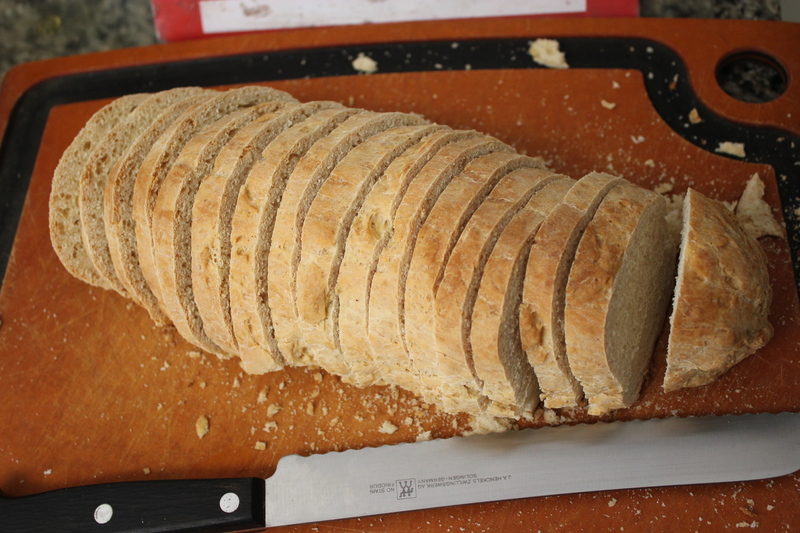 Cut each loaf into 1/2-inch slices. Lay slices flat on two parchment-lined or ungreased baking sheets. Bake for one hour. Remove the pans from the oven and turn the bread slices over. 5. At this point, if you wish to make cinnamon zwieback, blend the remaining sugar and cinnamon (see topping ingredients), then sprinkle about 1/4 to 1/2 teaspoon of this mixture over each slice. 6. Bake zwieback for one additional hour, until very crisp. Remove from the oven and let cool. Store at room temperature in an airtight container. Makes about 4 dozen zwieback toasts. This entry was posted in breads and tagged 19th century food, biscotti, biscuit, cinnamon, Eliza Leslie, food history, King Arthur Flour, Mary Randolph, Rusk, ship's biscuit, zwieback by revolutionarypie. Bookmark the permalink. So delicious!!! And very interesting. I love this blog. Can’t wait to try the recipe! Let me know how it turns out, Michele. And thanks! KAF has a lot of good, well-tested recipes! A very informative article on zwieback. Sadly, this cultural knowledge is lost to most. The early image conjures thoughts of hard tack, salt pork, pemmican made from moose, and the great outdoors. I was looking for inspiration for my daily writing warm up. I feel a tall tale coming on. Thank you. That ship’s biscuit is something, isn’t it? And I had never heard of pemmican, so thank you! I used these as teething biscuits for my children. I think my mother did that, too, and I kept eating them all through my childhood. Just a note…. in the Molotschnaya dialect, Tweibach is pronounced Tway bak and the German zwieback is tzvi bak. Thanks for this information about tweibach, Steve. Very interesting! I want to try making them someday.